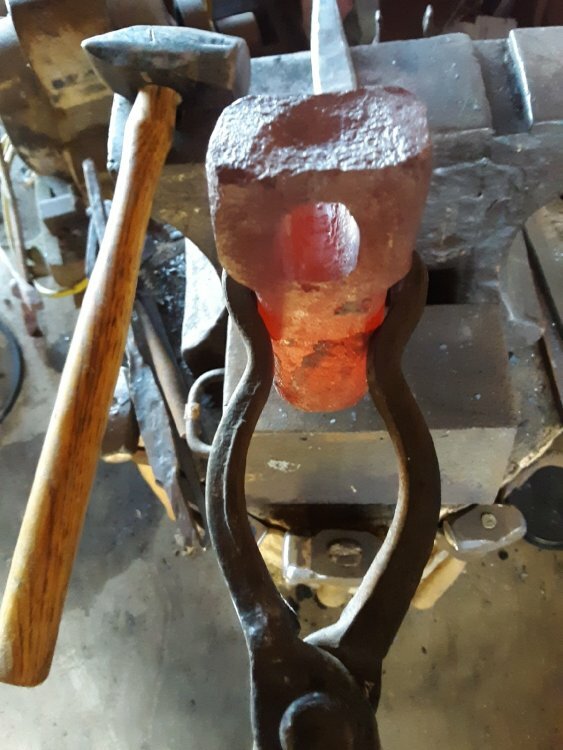 Making a dogs head hammer. This started life as a Ford 9 inch rear end axle. 5 inches long and 1.5 inches tapered down to 1.25 inches. 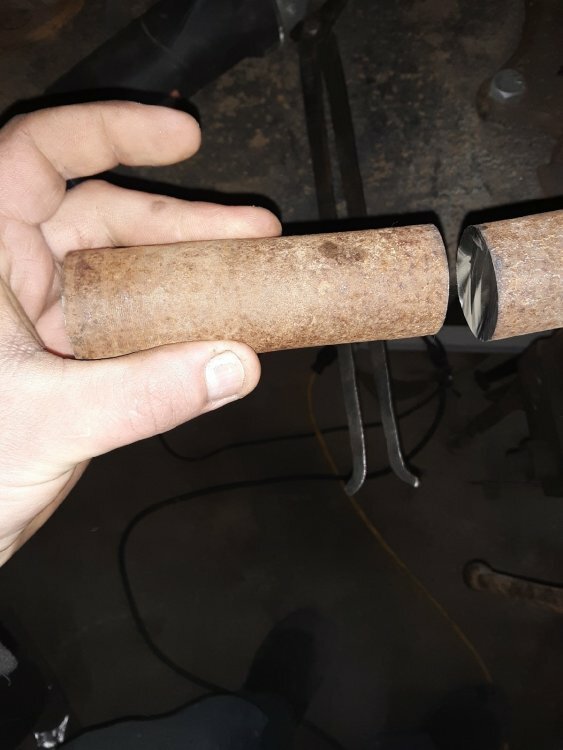 Well I thought my propane would have lasted a little longer but tomorrow in busting out the coal forge and the charcoal.....maybe I can get it done. Good start! 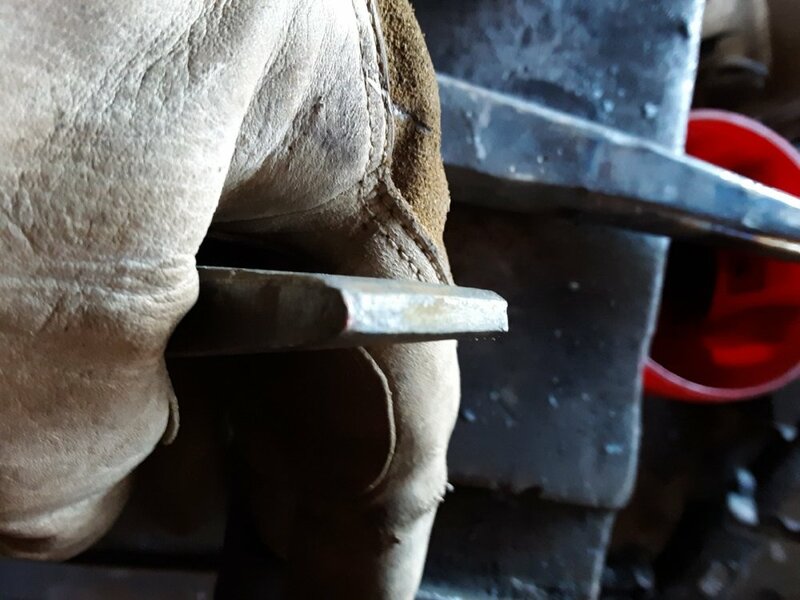 Are you going to angle the handle via the eye, or a bent handle? Or go Japanese-style and have it a right angle? I'm thinking of doing a bend in the head like this one and glen of GStongs on YouTube makes them similar. He has a special anvil he had made for doing it. 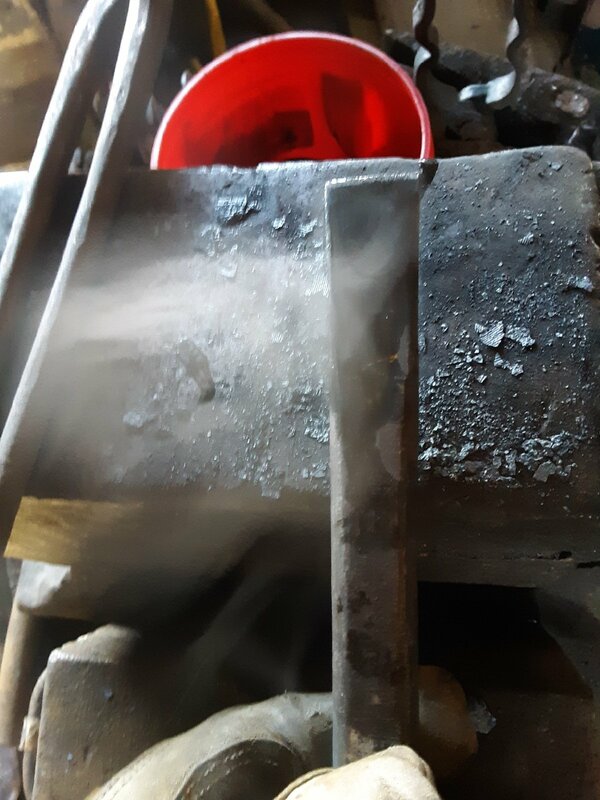 So it is really windy here today so I'm not sure I will fire up the charcoal forge. Maybe I will see how much money I have and get my 100 lb tank filled today. Charcoal dust probably doesn't work like coal dust as a punch release does it? 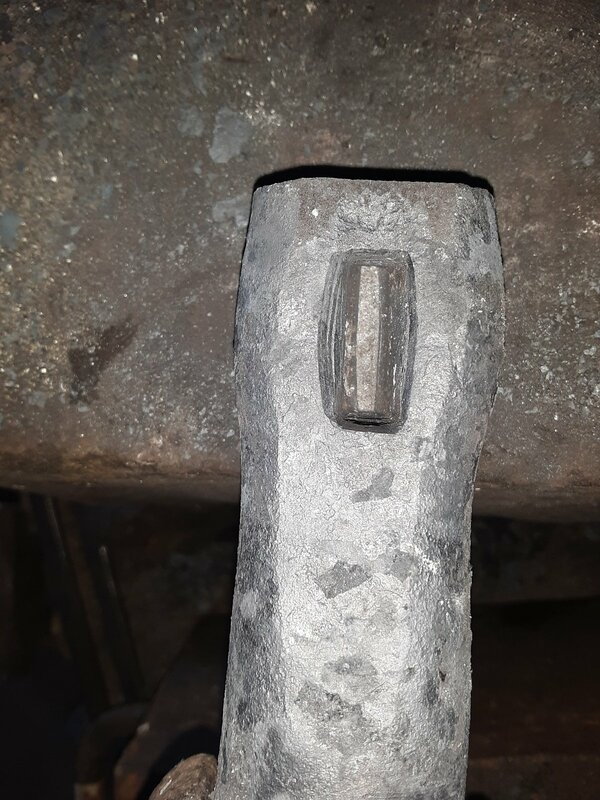 Well charcoal briquettes work as a punch release!!! Pretty much anything that burns works as punch release. Here is the tooling I used. 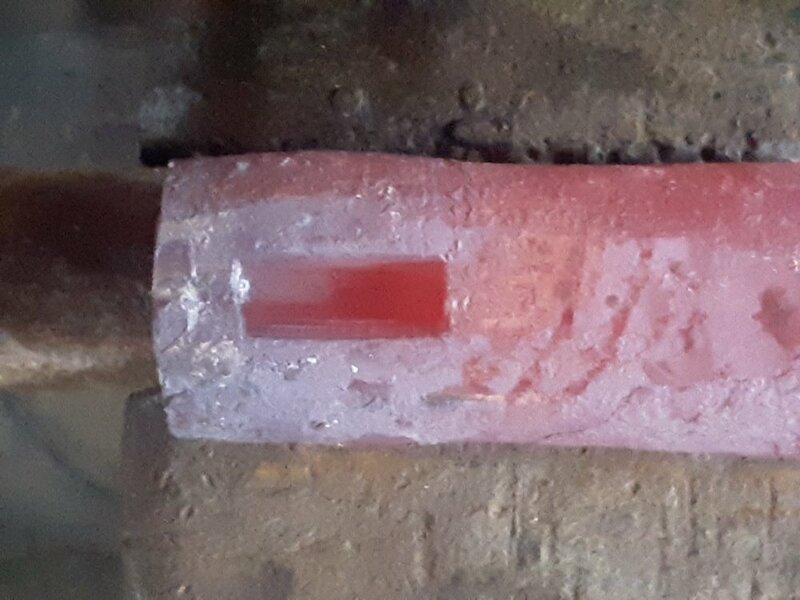 rough forged drift. drive the hammer eye punch in as far as you can while cooling it often. 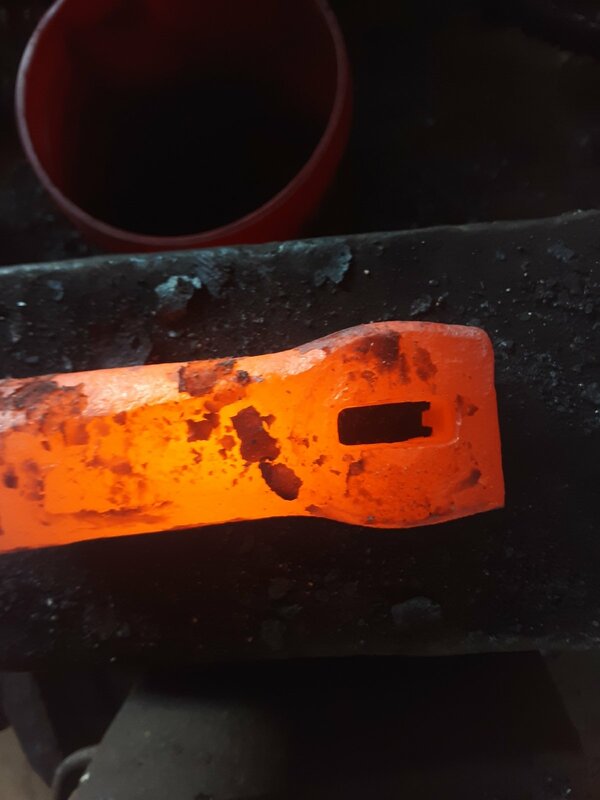 once the material starts bouncing back up when the tool is struck flip it over and find the cool spot and start to drive the slug out. 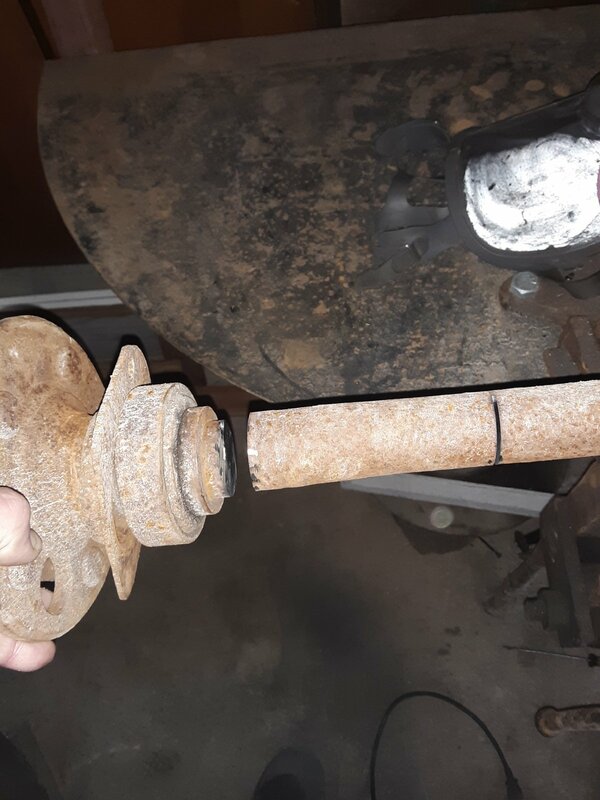 heat it back up and drive the slug out and begin drifting. The eye ended up dead straight. That's about all a this man can do in a day. Time for some soup and sit back in the recliner. 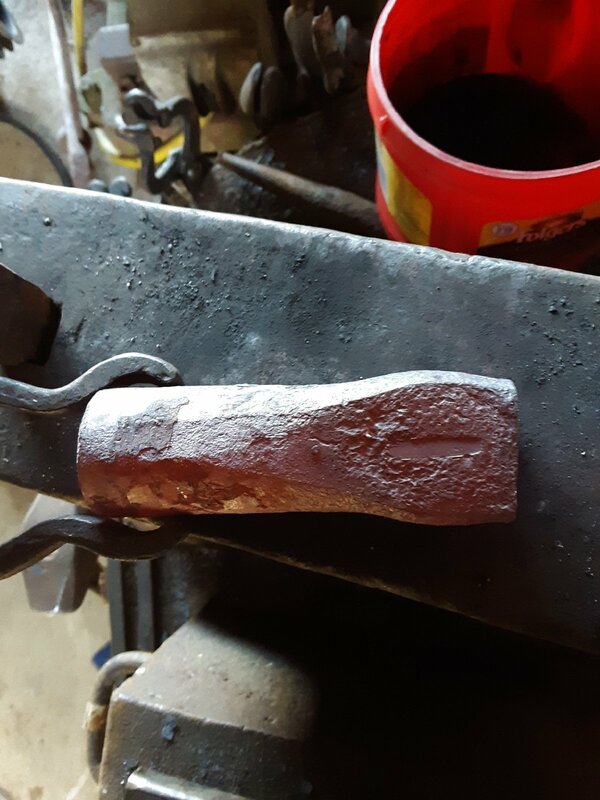 I have some more pictures of forging this if anyone is interested in seeing them. In a week or so of use be sure to give reviews. 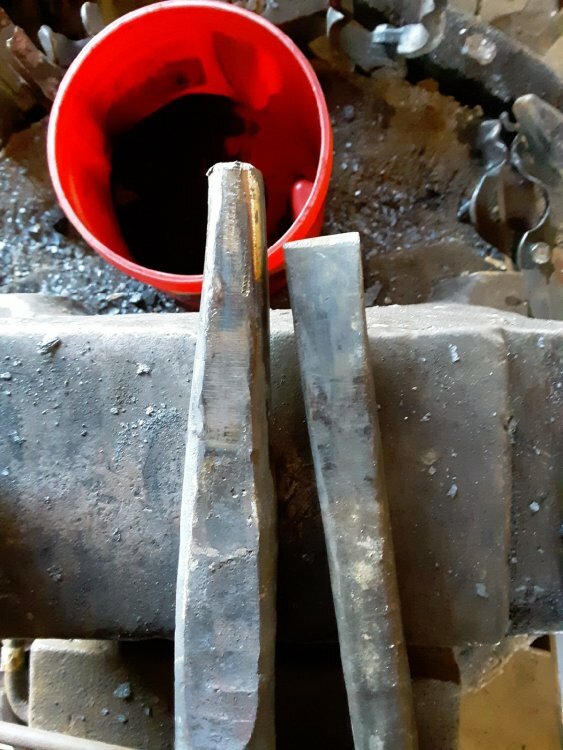 I find they do two things very well indeed: pointing a bar and forging bevels. Oddly enough, exactly the sort of thing we like to do around here. Thanks!!! I will let you guys know how it works. I want to make one now with the eye slanted. Would you have to have a slight slant on the eye punch to get it to slit at an angle? I'm not sure on the weight yet. My little digital scale wont go up high enough. 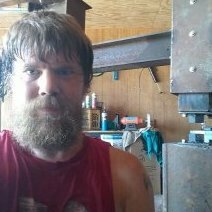 I have a friend that has a triple beam scale I'm going to get a weight with it. 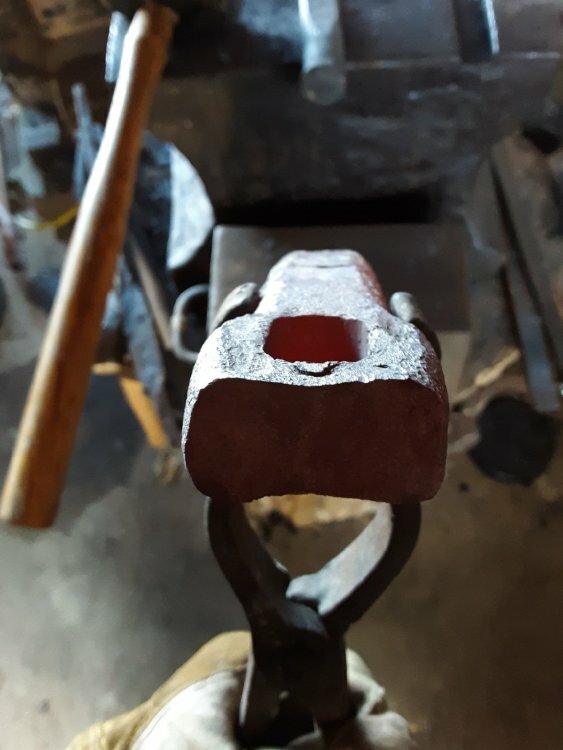 To make the slanted eye you use the same punch, but you taper the body of the hammer itself so that when it's flat on the anvil the punch automatically makes a slanted eye. My 3.5 lb. 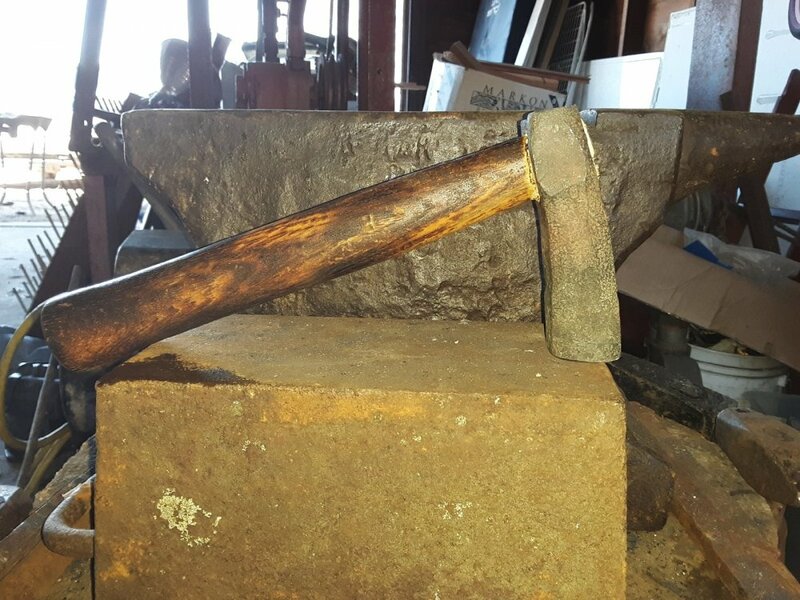 saw-doctor's hammer is about 2" at the face and tapers to about an inch at the eye, 6 inches away. On the one Owen Bush made for me the slant is not as pronounced, but the handle is twice as long. It's about 2 inches at the face and 1.75 inches at the eye, about five inches back. 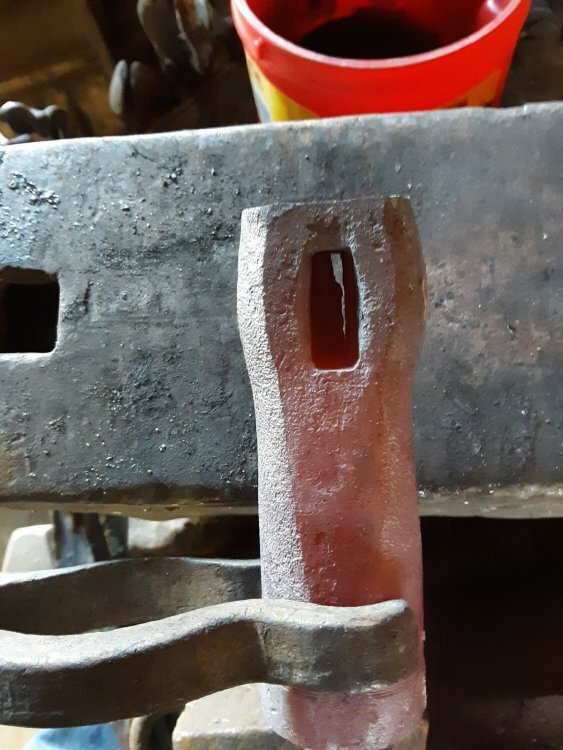 Mark Aspery shows how to do a angled slot punch in (I think) volume three of his blacksmith books. 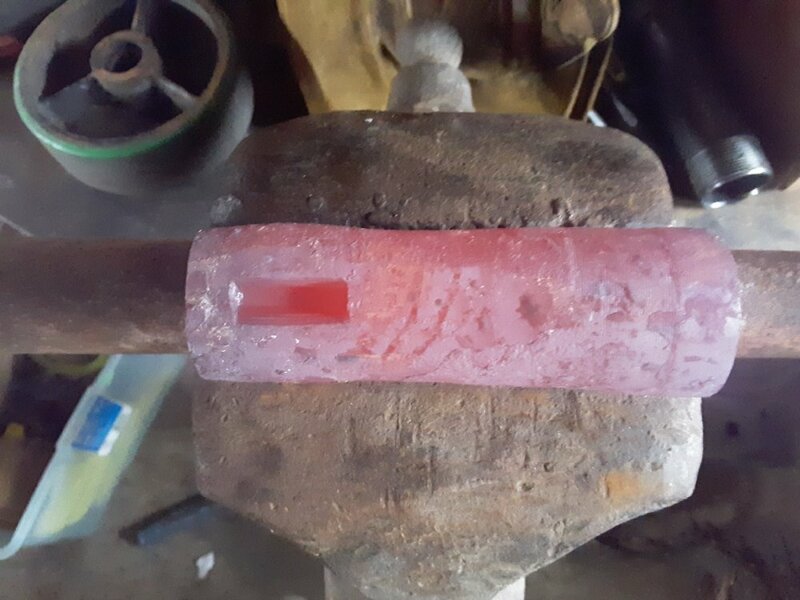 That's the method I used for this hammer. I'm going to have to get his books. I've heard a lot of references to them and I need to be able to go to them and see it. 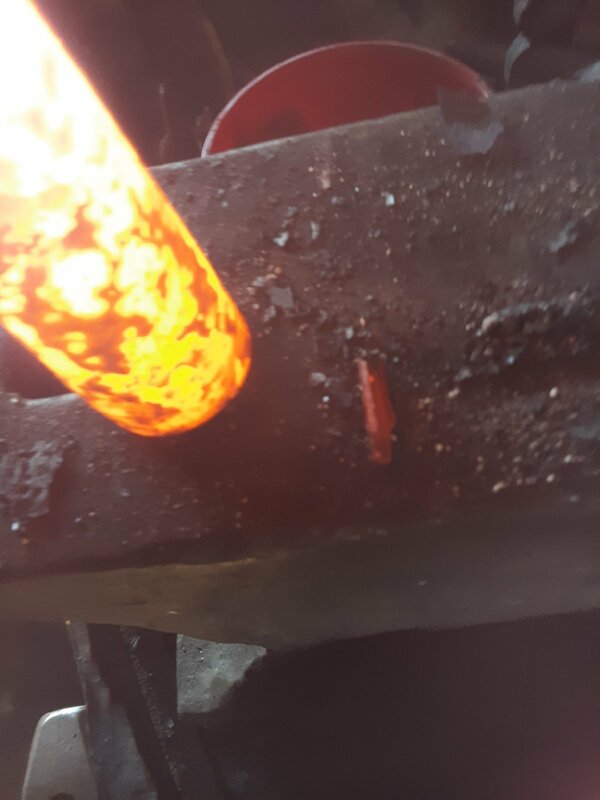 I'm going to edit this with more pictures of forging so check back in an hour or so and I'm going to turn this into a WIP sort of even though it's already done. 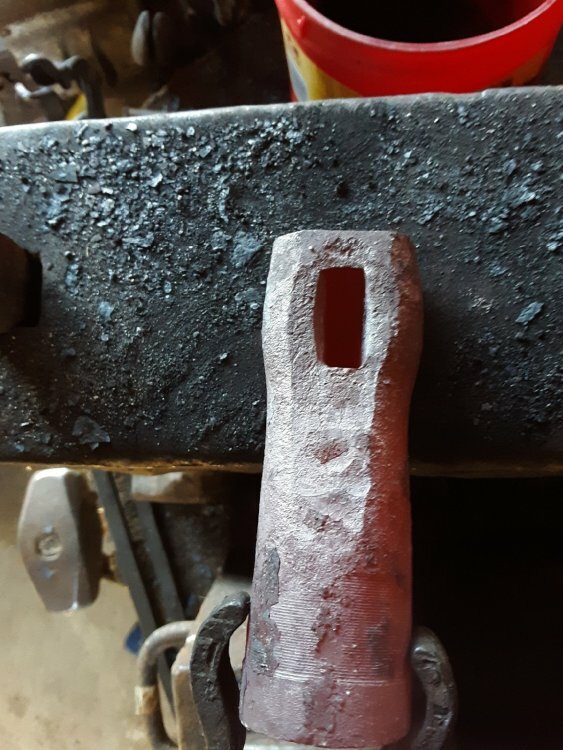 I've never tried it but it's been explained to me a few times that for the slanted eye, you punch through straight on one side then on the other side you punch straight but positioned slightly forward or backward from the hole on the other side. Then when they meet in the middle, they don't perfectly line up but you can then get the punch in and start working on the slant that's sorta built in... If that makes any sense. I have another axle I found at the scrap yard that I'm going to start making another hammer with but it is a lot bigger in diameter. I am going to refine the shape a lot more and draw out the "cheeks" of the eye more. 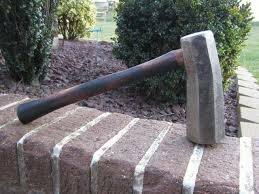 I had an appointment with Chris Briggs this morning and I brought my hammer with and we weighed it on the hospital scale and it weighed in at 2 lbs even with the handle.